"A Brief History of the FNCA"
the Maine Association of the New Church. © Beki Greenwood 20081914 Rev. Herbert Small held a New Church gathering in Center Lovell ME. 1920 Rev. Louis A. Dole became pastor of the Fryeburg New Church, and together with Rev. John Whitehead and Mr. Walter A. Robinson decide to have a summer school in Fryeburg, Mr. Robinson offering to underwrite the cost for 1921. 1921 First session of one week only. Visitors roomed in the village. Lectures and classes were in the Fryeburg New Church, and meals were served by the village baker at the New Church Hall. Thirteen sat down for the first meal. Village members and summer residents attended lectures by Rev. W.L. Worcester, Rev. John Whitehead, Rev. Louis A. Dole, Rev. Paul Sperry, and Rev. George H. Dole. 1922 Session extended to two weeks. Meals $1.50 a day, rooms $3 - $4 a week. Rev. Harold Gustafson and Rev. Paul Dresser were added to the faculty. An average of 67 attended lectures and 18 children had classes. 1927 Miss Mary L. Gordon rented the two dormitories of Fryeburg Academy for housing and feeding adults. Children camped at Mr. B.T. Newman's on Lovewell's Pond. 91 Adults and 37 children registered representing 12 states. It was voted to organize and incorporate the Assembly and to buy property on the Saco River about a mile from the village. Mr. John Osgood had found the property. Since this plot of twelve and a half acres had not much valuable timber, it cost only $600. Rev. Louis A. Dole was the first president. 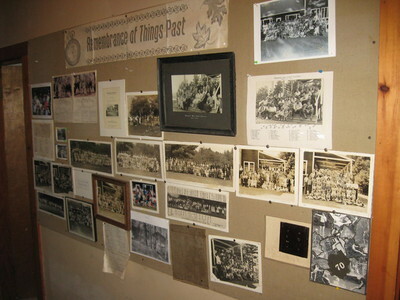 1929 Construction was begun on the first building (the present kitchen) financed by a loan of $1500 from Mr. Asa E. Goddard, which was repaid by 1932. Plans for the complete Assembly were drawn without charge by Mr. E. Donald Robb of the Newtonville Society. 1931 © Trevor 2015Present Dining Hall was erected with the help of a $2000 bequest from Miss Mary L. Gordon of the Fryeburg Society. The chimney and fireplaces were a gift of Mr. John L. Osgood. A $600 gift from Mr. L.H. Kunhardt made possible the driveway and tennis courts. Lectures and young people's classes were now held at the Assembly, and younger children's classes in the village church. The first cabin on the grounds was built by Mr. Asa E. Goddard, and the second by Mr. Fred Faxon. 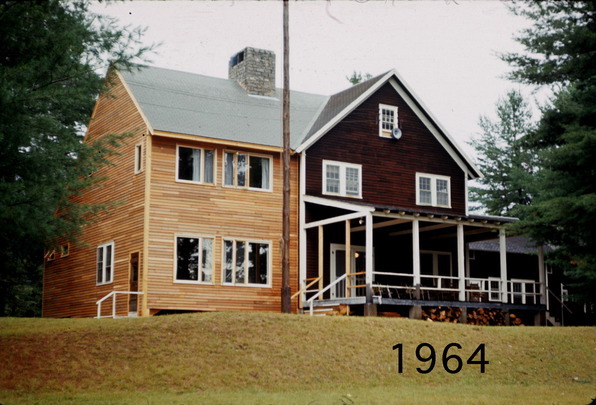 During the next ten years other cabins were built, including the Chalmers Lodge donated by Mrs. Chalmers for the use of the young people. 1932 A third week was added to the session to include the total eclipse of the sun at that time which attracted so many new people. These first twelve sessions of the Assembly are impressive for the well-known names of those attending and supporting the Assembly: besides those mentioned above, there were the Rev. Lewis F. Hite, Rev. and Mrs. Norman C. Goddard, Rev. John Daboll, Mr. F.H. Burdett, Miss Frances Twitchell, Mrs. Walter Swanton, Miss Florence Whitehead, Mr. and Mrs. Lloyd Frost, and Mr. and Mrs. R.B. Capon. 1937 The hurricane of 1937 made it possible to buy land between the original Assembly boundary line and the New Hampshire state line because so many trees were blown down making the price very reasonable. 1940 After 20 years as president, Rev. Louis A. Dole resigned and his place was taken by Rev. Charles H. Kuenzli. 1942-1945 The Assembly did not meet because of World War II. 1946 Rev. Kuenzli having passed on, Rev. Louis A. Dole became president again for one year, long enough to put the plant in good condition. He was able to handle things more easily than anyone else because of his long experience. 1947 Mr. F. Gardiner Perry became president, and stayed in that office until 1964. 1964 The Rev. Louis A. Dole Memorial Wing was built. Rev. George F. Dole, Louis' son, becomes the president. 1968 The Perry Memorial Wing was built with two first floor rooms for people who couldn't climb stairs.